Sweat-Sock Soap Soup! Okay, Not Really. 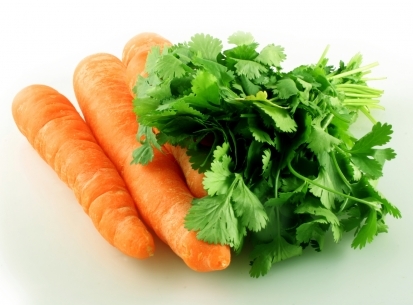 Cilantro, otherwise known as fresh coriander, is one of those foods that you either love, or detest. 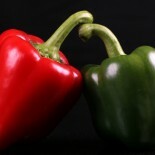 For many of us, it’s got a bright flavour that compliments all manner of meats and vegetables. For others… well, I’ve heard some of those others describe it as tasting like “soap”, “crushed bugs”, or even “sweaty gym socks”. It’s mostly genetic variations, I gather, that lead us to either find cilantro a citrusy, peppery delight, or, as they call it on IHateCilantro.com, “the most loathsome garnish of our time”. If you’re genetically inclined to enjoy cilantro, it’s certainly good for your health. According to this Nutrition and You article, cilantro is a good source of potassium, calcium, and manganese, as well as providing huge amounts of vitamin A and vitamin K. It’s good for digestion, too, and is very rich in phytonutrients. Probably you’ve eaten cilantro in the context of Mexican or Indian food, or possibly as the garnish called “Chinese parsley” in Chinese cuisine. The recipe I’m posting today is a variation of one that’s in a favourite cookbook of mine, Six Ingredients or Less, by the editors of Sunset Books. The dish has a kind of Indian influence, and though the main ingredient is carrot, the cilantro flavour comes through deliciously. 1. Peel and slice carrots and place in a large pot or Dutch oven. 2. Add chicken broth and curry paste. 3. Bring to a boil. Reduce heat, cover, and simmer until carrots are cooked and very soft. Add lemon juice. 4. Using a food processor or hand blender, puree soup. Season to taste with red chili pepper. 5. Serve soup in bowls. Sprinkle a generous portion of cilantro into each bowl. Garnish with a spoonful of sour cream if desired. I’ve never understood people who hate cilantro. That basically cuts out a lot of indian and latin food! That’s a great cookbook – I just bought the updated sunset compilation – i love how it’s so old school but captures california style cooking before it became co-opted by foodies. Is it California Style? I had no idea. 🙂 Just love the book – everything I’ve made from it has turned out beautifully. There’s a dessert near the back called Salzberger Nockerln that’s simple and delightful; it’s another one of my favourites from there. This entry was posted on May 15, 2013 by thinkreadcook and tagged carrots, cilantro, cooking, coriander, food, nutrition, recipe, soup.